Ashes of Creation is an upcoming MMORPG, set in a high fantasy open world. There is no upfront box cost associated with Ashes of Creation. Ashes of Creation is a subscription based game. "This allows us to avoid the pay to win mentality many free to play games employ, as well as maintain a steady flow of new content for all our players." Ashes of Creation will not be pay to win. "Ashes of Creation will not be pay to win, that is our pledge to the community. 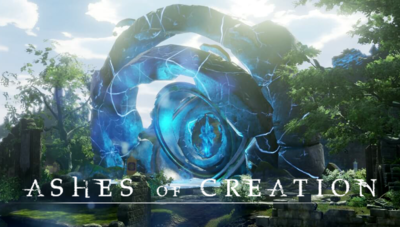 One of the core principles we set forth with Ashes of Creation is a very strong desire to maintain the game's even playing field." Efforts will be made to translate Ashes of Creation into multiple languages. Translation will be done in the game client based on interest. Ashes of Creation will be released on the PC platform. Console support may be decided at a later point. The developers are rewriting the Unreal engine 4 back-end to add proprietary networking code that will enable Ashes of Creation to achieve the mass combat in the open world, such as PvP, Node sieges, Castle sieges, Dungeons and World bosses. Server population will be around 10k concurrent users. There will be SEA/OCE servers. There won't be separate Roleplaying servers. 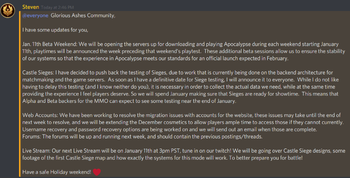 There will be individual servers with their own population. There won't be multiple channels on a server. Different servers will have different narratives. Things that happen on one server may not happen on another. 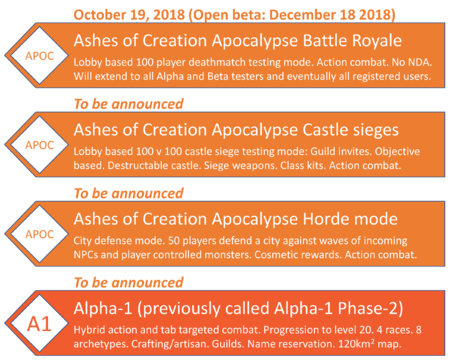 The Ashes of Creation release schedule is subject to change. Betas won through the weekly drawings ("Beta-0"). After Alphas, but before Betas. Head start for crowdfunding backers at the Founder level and above. 1-2 days before launch. Launch (live) release. To be announced. Major releases (DLC expansions). Quarterly. Ashes of Creation will be a franchise. The Ashes of Creation MMORPG is one of many intended products in the franchise. Ashes of Creation official website. Ashes of Creation official discord. Ashes of Creation official forums. Ashes of Creation official Facebook. Ashes of Creation official Instagram. Ashes of Creation official YouTube channel. Ashes of Creation official Twitch channel. ↑ 1.0 1.1 A reactive world - Nodes. ↑ Livestream 17 May 2017 (1:09:22). ↑ Livestream, 3 May 2017 (26:50). ↑ Livestream, 10 May 2017 (35:43). ↑ Livestream, 8 May 2017 (36:26). ↑ 14.0 14.1 Blog: Creative Director's Letter. ↑ Livestream, 18 January 2018 (2:48). ↑ 18.0 18.1 18.2 Livestream, 1 September 2018 (54:06). ↑ 24.0 24.1 Livestream, 8 March 2019 (1:02:45). ↑ Livestream, 4 May 2018 (47:57). ↑ 26.0 26.1 Livestream, 8 March 2019 (38:30). ↑ Livestream, 18 January 2018 (25:22). ↑ Livestream, 8 March 2019 (57:26). ↑ 33.0 33.1 Livestream, 8 May 2017 (11:14). ↑ Livestream, 17 May 2017 (41:27).